Here's an easy Thanksgiving recipe that will have everyone begging for more veggies, even the kids. Add this delicious and easy Thanksgiving side recipe to your Thanksgiving menu. Spaghetti squash is a delicious and nutritious vegetable and always in season this time of year! Here's a quick and easy way to prepare it. If you love Margarita style pizza, you will love this "Margarita" style recipe for squash.. adding ripe tomatoes, fresh basil and mozzarella cheese. This is a great recipe to make for any vegetarian guests at your Thanksgiving feast. So with the recipe below, enjoy and hoping it will be a staple for you every Thanksgiving! Directions: Preheat the oven to 400 degrees. Using a large knife, split the spaghetti squash in half lengthwise down the middle. Be careful! I usually select smaller size spaghetti squashes as they are easier to cut! In case you have never cooked a spaghetti squash, here is what one looks like.. there are all kinds of squash available so you need to get the right one! With the fork, scrape all around the interior and fluff up the squash. It should be stringy (like linguine!). Leave the squash in the skin and top with the tomatoes and fresh basil and mozzarella cheese. Pop under the broiler for a couple of minutes, until the cheese is melted and lightly browned. Allow to cool for 5 minutes before serving. Scoop out servings with a big spoon! Delicious!!! Best of all, this easy Thanksgiving recipe has hardly any calories or points if you are on Weight Watchers! Here's another easy Thanksgiving recipe for vegetarians using wild rice,seasonal fruits liked pumpkin and cranberries and vegetables.. a family favorite! And yet another great set of Thanksgiving dessert recipes.. all easy like this cute Turkey Fruit , vegetable and cheese display! Look how cute this visitor displayed with the turkey popping out of the teepee! Keep the kids busy while your turkey dinner is cooking! With a recipe that easy, you still have time to enjoy with your family. Here are some great Thanksgiving crafting ideas for kids and a fun Thanksgiving decorating idea that the kids can make! Or look at this assortment of printable games! 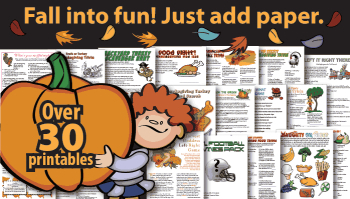 More FUN THANKSGIVING IDEAS here.. games, decorations and even favors for your guests!